Geeks Without Bounds is an inspiring Seattle-based group that I learned about through the Awesome Seattle foundation. Their work is similar in ways to NetHope and Benetech in terms of the sorts of networking and sustainability-review they hope to provide. But they are primarily volunteer-run, founded in the work already supported by hacker spaces around the world. They focus on making hackathons and prototypes for humanitarian tech work in practice — implemented through local practitioners, and embraced by active communities of develoeprs once they have proven their use. I wish them and their network-building success. We need better circles of shared practice in this area of life! Here’s an introductory video via Dailymotion. An idea born in 2010, by the American Mathematical Society and friends, now bearing fruit at a beautifully burgeoning MPE 2013 website. The mathematics of interest includes everything related to four themes: Discovering the planet, Supporting life on the planet, Human organization on the planet, and Risks to the future of the planet. 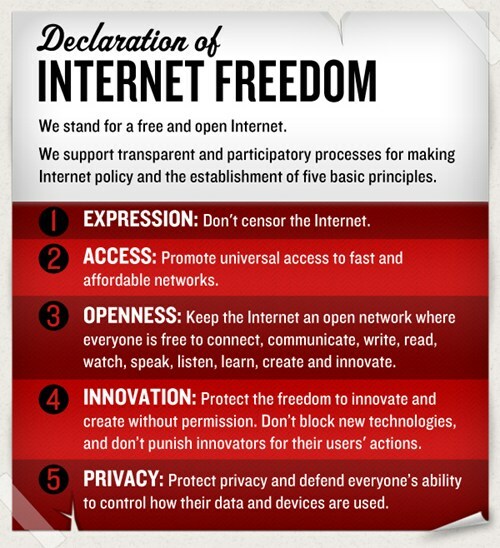 Why propose principles for Internet freedom and a “Digital Bill of Rights” when existing ones will do? We the People need our existing Bill of Rights to apply in the digital domain. I love it when one of the seventeen pillars of society starts to emerge anew. Peter Sunde, public face of The Pirate Bay during its publicity and trial over the past six years, recently published a long personal essay about the experience. Thanks to Rick Falkvinge for translating the essay; and to Sunde for sharing it. Please read it. Club Floyd collects collaborative IF meta-stories. via Jacqueline A. Lott Ashwell. Hawking on the Higgs: It’s a pity in a way… I just lost $100. the particle that gives mass to other particles. particle physics, the theory that explains all our experiments so far. This is an important result, and should earn Peter Higgs a Nobel Prize. have come from experiments that gave results we didn’t expect. that the Higgs particle wouldn’t be found. Kudos to everyone involved in that turnaround.